It’s funny what injuries can do to a club. Injuries can change a club from a Cup favorite to barely hanging on. Injuries can also change a team’s fortune, putting a backup goalie in net, showing he is actually a generational talent and keep the starting job. Both of these cases have happened to the Rangers in the past 15 years. Most injuries, though, force coaches to play a guy they haven’t necessarily looked at in a serious starting capacity. This time around, that player is Tony DeAngelo. 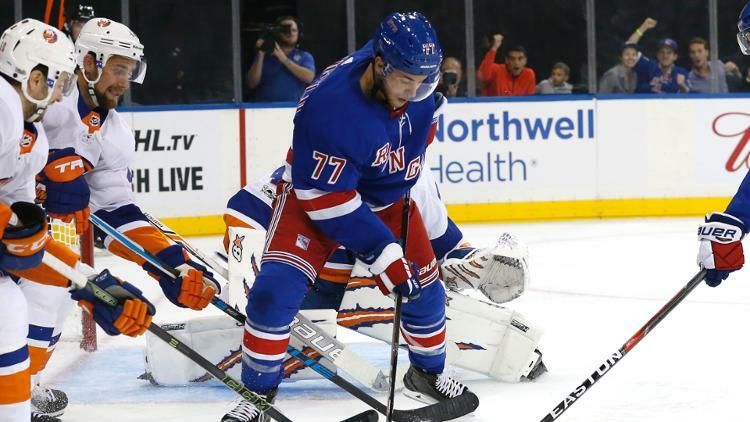 The injuries to Neal Pionk and Fredrik Claesson have forced David Quinn’s hand, and DeAngelo has been forced to play recently. In the four games he’s played since, he has two goals, an assist, and one assist called back on an offside review. He’s also played fairly decent hockey away from the puck while paired with Marc Staal. Staal, during this four game stretch, has played exceedingly better, not including the Columbus clunker where no one played well. Both Staal and DeAngelo have been on the overwhelmingly positive side of xGF% and CF% the last two games, with DeAngelo tacking on a third game of great numbers against the Islanders. Long story short, these two have shown some decent chemistry together. We are playing with sample sizes here, but DeAngelo and Staal are also one of the better pairings on the club, not just for each other. At the very least, their chemistry together has been worth a longer look. We certainly know that they are better than the disaster that was Staal/Pionk. Rob Luker also agrees, noting that Staal/DeAngelo significantly outperforms Staal/Pionk in every major category. DeAngelo certainly isn’t perfect, but he’s been the most capable of dragging Staal through quicksand. Sure, it’s a four game sample. But in the vacuum of ice time, recent performance matters. If coaches can lean on “not changing what’s working,” then this certainly falls into that spectrum, right? If the Rangers are serious about DeAngelo in their future, then now is the time to see what he can do. It doesn’t have to be DeAngelo or Pionk. It can be both. "The case for leaving Staal and DeAngelo as a defense pairing", 5 out of 5 based on 11 ratings. I like that Staal makes people eat crow. And I hope he’s a Ranger for his entire career. How does Staal make people eat crow, by being a terrible excuse for a top-4 defenseman? By mishandling endless amounts of passes and breakout attempts? By not hitting anyone due to his concussion issues? Not really sure how that works out. What you see or like has no bearing what so ever on his career or being in the line up. Perhaps a revaluation of your opinion is in order. Presented with such evidence, who can argue? You’re right, a 32-year old injury-prone defenseman who’s regularly unable to complete a pass or hold a puck in at the offensive blue line, who’s got a 43.7 Corsi this year and hasn’t been close to even possession numbers in years, with a career high of 29 points set eight years ago is really actually the best defenseman in the NHL. Thanks for setting me straight here. I like the DeAngelo Staal combination and Dave built a good case for them. We heard the same dissing of Staal that we heard about Dan Girardi. And he yet has done quite well in Tampa Bay thank-you since the Rangers bought him out. As a 3rd pair defenseman on a good team, with salaries in the $3 million range, Dan Girardi or Marc Staal are fine. As first pair defenders with annual salaries that are in the $6 million range, with no-movement clauses, they are abysmal. Not too hard to figure out, life is a matter of timing sometimes. The same can be said about Lundqvist. The Rangers are paying him 8.5 million a season while his .906 save percentage is bottom tier amongst starter NHL goalies. Oh noooo noooo noooo you didn’t Bloomer ! Nobody’s talking about Lundqvist, this is an article about the defense. Marc Staal is a veteran on his last legs, at age 32. At age 37 Hank is still a legit #1 goalie, even an asshat like yourself would have to admit that being 2 points off league average save percentage is quite a bit better than being a one-eyed defenseman who doesn’t score, hit, skate well, or suppress shots. I’m not sure if analytics are a part of the Ranger’s evaluation culture. But, hopefully whatever evaluation process is being undertaken, they see the progress DeAngelo is making in contrast to Pionk. Lias Andersson aside, ADA may prove to be the main reason the Rangers win the Stepan trade, or at least break even. And I think Andersson will be a good NHLer. From what I’ve seen, there’s a lot more upside with Tony D than with Pionk. TD isn’t any worse than NP on the defensive side, and is by far the most dynamic offensive threat they have on the blue line. If he keeps his head screwew on right, the kid brings an awful lot of talent to the table. I really wasn’t sure on DeAngelo going into this season. But he’s impressed me more and more each time he plays. I see the emotional sides of him. But he’s under a lot of pressure and scrutinized every game. He belongs in the NHL, and I hope Quinn and the Brass upstairs see it too. I think if he can find him consistent ice time, DeAngelo will settle down and play well. Unfortunately, I think there’s an element of not wanting to completely devalue Smith weaved into all of this too. As for Staal, he seems to be a calming presence for these young, offensive d-men. He’s similar to McQuaid in that way. DeAngelo has essentially 4 points in 4 games playing with him. I think it’s a no-brainer to keep them together right now. Tony D has earned a spot. Our issue is offense (and lack of pressure). Better be a productive summer for the GM – DQ can only do so much. Jesus – this is NY – can’t we get two offensive studs? Zuke is now our top line winger – really? F’ to all the Staal haters……. Looks like all the Rangers had to do was hire Trotz – instead of going through this ‘rebuild’ to nowhere. Quenneville is out there. When the Rangers get serious again about being competitive they should consider hiring him (if Quinn doesn’t work out). Its a shame that the franchise is going through this tire fire when all they had to do was replace AV. Lmao… more calling for Quinn’s head…. really? This team is mediocre at best with Quinn… with Trotz… with whoever….. this team isn’t good enough to make playoffs…. so I’m all for more trades and let the coach mold his own team… Trotz stunk as a playoff coach prior to winning with the cup with caps…… Quinn deserves his opportunity and is going nowhere anytime soon…. Quinn is here for another 3-4 years until the hot seat. Q is notorious to being faithful to vets. He wouldn’t work with this roster or movement of being younger. Oh wait. He took a younger Blackhawks roster and molded them into Stanley Cup winners. So I ask, what else is new? Anything he puts out there is bunk!!!!!! Seabrooke Kane Toews Keith …yes Quinnevillve was a deperment to their developed they never amounted to anything. 2. What is a deperment? AV destroyed the D with a comical idea, not to much hockey sense to it. Build with what you have, not what you think. Lead to gold never worked. Anyway tired of talking about AV, its over and done. Real blame is on Slats and I know he really tried. No one takes a job and wakes up wondering how he can screw up. Dolan its time to do what Arianna says…..thank you next! Staal is going to play anyway, so if it keeps DeAngelo in the line up, then sure why not? Staal is the perfect complement for ADA. An incredibly deficient defensively Pionk was serviceable with Staal, ADA should be better. In spite of the mindless chatter, Staal, admittedly surprisingly, has been the Rangers best dman for a 2nd season in a row. And somewhat similarly, Skjei has played his best hockey with McQuaid, who will be missed when traded at the TD for at least a 3rd round draft pick. Very shrewd move by Gorton to trade for McQuaid, giving up very little. Both AV and Quinn appreciate that developing a young offensive dman works best when paired with a solid defense minded partner. Why few appreciate this is beyond me. Because neither Staal nor McQuaid are “solid defenders”, that’s why. They are both mediocre players on their best days. Saying Staal is the best dman on NYR is like saying “in a massacre, this person was the last to be killed.” It is a meaningless distinction. Not to mention it is untrue—I’d say Claesson, DeAngelo, and Skjei are still all better than Staal. And Lindgren looks better in 3 games than Staal has all year. Dave I don’t think you need to make excuses for ADA’s play in any respect. I think he’s just been fine playing in the defensive zone. I have more faith in Tony making the right play in the d’ zone when he has the puck than any other d’man playing right now.